and props for doing a wild DEMO, and not just another jackass the movie-clone, for the wild demo compo. great work! Thumbs up for doing a real wild! hmm.. there is a PC running that LCD-thing but effects are SO simple? I have no idea whether this is techically good but as an idea it was wicked. One of the rare concepts that fits the original idea of Assembly wild compo since most prods go to either combined, mobile or oldskool democompo. i simply love the 1-bit-plasma!!! 2 thumbs up!!! Very original idea that really captures the spirit of the compo, by doing something pretty impressive on a very unimpressive and unorthodox display. The scroller was hard to read due to the inherent properties of the LCD, but it sure made the plasma look good. Nice work. What I dislike in this kind of oldskool productions is that their only goal seems to be to do the same ages old rotozoomers/interferences/plasmas on some more original platforms. So the only original part is finding a platform. I understand, though, that it's much easier to show off simple old rotozoomers on that kind of low-resolution display, so thumbs up still. A little correction: the other original part is of course mastering the platform. It's however hard for me to say how difficult platform this one was. reminds me of the (winning) wild demo entry by fox and goof for siliconvention'97. 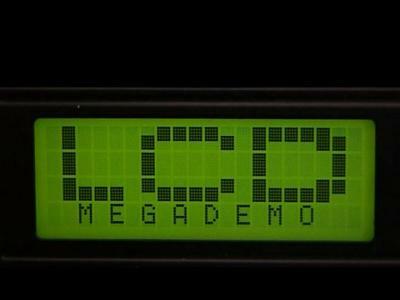 regrettably there's no video footage of this demo, but except for the scale of the display (in their case approx. 150*70cm) it was pretty damn similar. the main problem with such demos is not the coding part, but coming up with ideas for effects that are actually recognizable as an effect instead of random pixel blurb. thumbs up for this effort. but i thumb up for the idea and for the plasma effect. This is one shows the true meaning of wild demo concept :) Hyvä fragu! Cool. Who needs colors anyway? Paradoxically, this cold lcd warms me. The effects look surprisingly good on that screen. page created in 0.022971 seconds with 15 queries.